Calculators are not just electronic gadgets. They are the lifeline to the people of many professions as well as a lot of students. Even this might be an understatement. The modern calculators that are used play a pivotal role in enhancing the professional and academic acumen of the professionals and the students alike respectively. In fact, using the best of these gadgets is always an added advantage for obvious reasons and hence, it is crucial that the best product is purchased to make sure that the investment works out for you. As a math nerd, I love calculators and I know how to separate good calculators from bad. This article will give you some of the key insights to make the correct decision while buying a calculator. The review is partly based on my own experience of using various calculators in the past and party based on all the information I could get about the products as well as reviews from other users. These are the three key components you need in order to fully evaluate a scientific calculator. The very purpose of this review is to create a crystal clear notion even about the very excellent calculator for college, or the one used in the professional world so that there is simply no room for any skepticism and doubt before you opt for the product. The review has its own stance, a lot of it is very technical in nature and is filled with facts and figures, statistics and latest information acquired from various authentic sources to make sure the end product that we deliver is as close to real life as possible. Wherever possible, I’ll try to explain my stance in the simplest possible way. I will also list some of the Ultimate scientific calculators and best graphing calculator here and review them to make it even more easy for you. *All links above will take you to the latest prices on Amazon.com or you can read our in-depth calculator reviews below. Now that we have established how we wrote these reviews, let us begin with the actual reviews and the top ten calculators out there. If you want to buy a calculator with graphing abilities, then there aren't many good options out there. From Texas Instruments, the TI 84 Plus model is the best one out there. It is highly powerful, good memory and display have a strong contrast which makes it clearer to see. All this at quite an affordable price. It comes with MathPrint™ technology. This is an amazing technology which makes the experience of using this calculator all the more engaging. It allows you to enter equations and fractions in generally accepted notations rather than in calculator notations. It has a big enough LCD display which can show multiple plotted graphs along with equations. Because of its amazing clarity, you can see minor details on the graph. Add-on apps that come with this calculator make this product even more powerful. These apps allow you to do a lot of things from calculating polynomial root finder to analyzing the graphs and statistics with regression and graphical analysis. It has 24K RAM and 480 KB ROM. This is why it can be used for a wide variety of tasks. You can also connect it to a computer via USB or share files with other computers. In conclusion, with its amazing features and performance. This calculator is for people who wouldn’t settle for second best. It’s the latest cutting edge of calculator technology. It can be used on all higher courses as well as professions. This is another great product from the Texas Instruments brand. I chose this to be one of the top calculators mainly because of its quality and price. This one comes with a two-line display which allows you to see your problem and solution at the same time on the screen. This is a battery operated calculator but it is designed in such a way that it lasts for quite a long time. The long battery life of this calculator helps you use it to the fullest extent and save your money in the long run. It can handle up to 2 variable statistical calculations. This is perfect for students learning basic math, sciences or statistics. Highly useful for students of middle-school or high school. Angles in this calculator come in all three formats - radians, degrees, and grabs. It has engineering notation modes too. You can easily switch back and forth according to your convenience. It has a highly attractive design with black color in front and blue in the back. Your peers will be impressed by its design for sure. In conclusion, it has almost everything that you need in a good scientific calculator. It is both affordable and durable and comes can handle even the most complex problems with some exceptions. Recommended for school and college coursework where graphing is not allowed. Texas TI 36X Pro is one of the best non-graphing scientific calculators. It has a lot more features than other Texas calculators we have discussed so far. It enables you to solve far more complex problems at a higher speed. While the price is higher than other models, it is totally worth the price given its features. Allows you to work with Boolean logical operations as well as statistical analysis. This is helpful in a wide number of fields ranging from computer science to economics to engineering. It is the perfect combination of great design as well as ease of use. For example, unlike other models, it has separate buttons for exponential which saves you a lot of time while doing calculations. Furthermore, solving trigonometry in this calculator is quite easy because of the convenient location of inverse trig and trig functions in the calculator. It has the multiview feature which helps you to solve multiple problems in real time. This helps you maintain your pace while you are working. It is highly portable because of its unique design. This is a great advantage for those who travel a lot while working. Overall, this is a great choice for higher level students who don’t need graphing or where graphing is not allowed but a powerful calculator is needed. It is also quite useful for professionals as it provides speed and some very good functionalities for them. 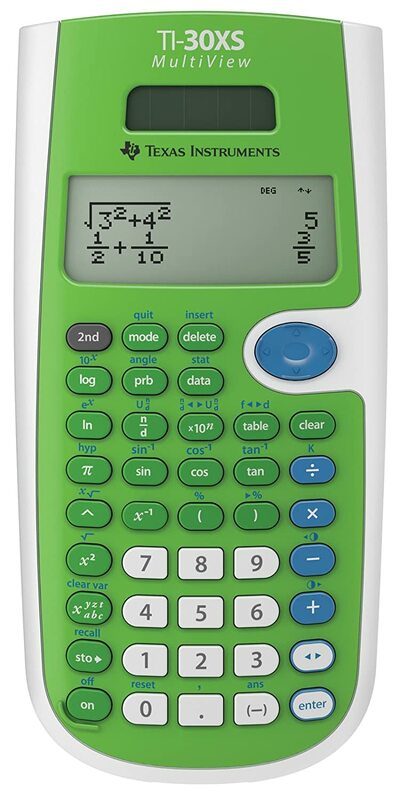 This is a great scientific calculator for those studying in high school. It has a four-line display. The design is not very impressive but it has some good features and is quite affordable for the value it provides. Below are some of the unique benefits of this product. Allows you to enter multiple calculations on it and compare them in real time. This enables students to learn about the problems in a better way and understand it more clearly. It comes with MathPrint™ mode which allows you to enter problems in commonly accepted notations. This is a huge plus point for those who are new to higher level equations. It runs on a battery and solar power. No need to charge it every few days. This calculator comes with a bunch of other editing features such as cut, copy, paste, etc. This makes your work fast and will enhance your productivity in many ways. You can toggle back and forth between decimal forms and fractions. This allows you to solve almost every type of problem with this calculator and get the result in the format that you need at the moment. Overall, this is recommended for students learning general math or sciences before graduating. Once you advance to a higher level, you can switch to other more advanced calculators. This model is Casio’s response to the TI 36X Pro Model. It is incredibly powerful as well as user-friendly. Although, if you have been using TI calculators for a long time then you will find this a little bit challenging as it has a completely different design. Here are some other good things about it. It supports more than 280 functions from fractions and statistics to linear regression and polar-rectangular conversion.Other than graphing, you’d be hard-pressed to find anything that you can’t do with this calculator. The biggest advantage of this calculator is that you can see the step by step calculations for the problems. This is a big advantage for those trying to understand the problem they’re solving. It comes with the ability to go back and edit the problem to recalculate everything in case you made a mistake. This greatly improves the efficiency of your work. It comes with a natural textbook display which displays the expression in the exact manner as they would appear in a textbook. It runs on battery and solar power as a backup. This is a pretty good combination and it is used by many other calculators as well. So, this product is a much cheaper version of TI 36X Pro and is much more user friendly once you get used to it. I recommend this to all those who aren’t a big fan of Texas Instruments or love Casio calculators. TI 30Xa is one of the most inexpensive scientific calculators from this brand. It has a smart design and pretty good performance if not great. It supports a lot of math expressions. This is a nice and affordable calculator for most middle school to high school students. It has a smart design. It gives you high scalability and flexibility as well as good price to performance ratio. This makes it even more inexpensive compared to other calculators. Supports a lot of functions. From basic arithmetic and fractions to logs, trigonometry, powers, roots, and factorials. It is a battery powered calculator but its batteries can be replaced easily. This makes it last longer as you don’t have to buy a new one when the battery gets discharged. Supports a wide range of conversions. Angle conversions of degrees and radians,fractions to decimals, polar to rectangular and some others. This makes it quite flexible for different types of problems. Overall, this is a recommended calculator for those who need to work more with numbers than abstract functions or equations. This calculator is affordable and recommended for middle or high school students or those who constantly need to solve non-complex math problems in their work. This is the last one on this list. HP 35s is a good scientific calculator without the graphing feature. I recommend this to middle school to college students. A lot of professionals use this calculator too, but there are other far better options for that. It is the only calculator that with RPN or Algebraic entry system logic. This is immensely useful for some people. You won’t find this feature in almost any other calculator. It has a 2-line alphanumeric display. It is the basic standard for almost all scientific calculators so nothing fancy there. It is made from heavy-duty materials. The calculator will last for a long time because of this. It is also tough so it won't get damaged easily. It has an adjustable contrast system. This is quite helpful for those who want to customize the display to fit the needs of their eyes. I recommend this calculator for those looking for a durable and affordable calculator for mid-school or college level education. The brand HP is quite reputed and it comes with a lot of features to allow most calculations you need. Casio FX 300MS is quite lightweight and user-friendly scientific calculator. It has been approved by a lot of educational institutes including many professors and teachers. We chose this calculator because it gives you a good set of features along with its portability and ease of use. It has a two-line display. This makes it more user-friendly as it gives you more room to solve problems. This calculator comes with backtracking feature. You can go back and see each step of the problem. You can also edit the problem and recalculate the solution instantly. More than 240 mathematical functions. You can do almost anything with this calculator. You can calculate permutations/combinations,standard deviations, angle conversions and much more. Battery and solar powered. This two-way power system is quite resilient and therefore your calculator will not run out of power while you are in the middle of your work. Supports trig, reverse trig as well as exponential problems. This is quite useful when you are doing lab assignments or projects. It has a sturdy build. Despite its small size and light weight, it will last for a long time. Overall, a highly recommended product. It isn't anything special. But it provides good features from all the other calculators and packs them in a user-friendly way. It does not come with graphing capability so students will find this quite useful specially to use in exams where graphing technology is not allowed. If you are looking for a graphing calculator that’s powerful yet affordable, then Casio FX 9750GII is the perfect choice for you. This calculator looks simple but it has a lot to offer. It comes with good memory, USB connectivity and a set of AP features that can be highly useful for a student. 62KB CPU RAM that comes with this calculator helps you solve lengthy and complex problems in a fast and highly accurate manner. It is quite reliable for most use cases. It has graphing features and it can feature different types of graphs on its screen. Pie charts, bar graphs are also supported along with the regular graphs. High-resolution LCD display makes it clear and displays sharp image so you don’t miss small details. It supports USB connectivity. This feature helps you share files to different calculators or connect it to your computer. It comes with AP stats feature. This feature is useful for middle school and high school students. It helps them solve the problems they most frequently face. Overall, it is not as good as Texas Instrument’s graphing calculator but it has an insanely low price tag which makes it totally worth buying. It has an intuitive hardware and software design and it is much easier to learn than the TI 84 model. This is why I highly recommended it. If you are a fan of pink color and want an aesthetically pleasing design, then you will love this calculator. But that is not the only good thing about it. This is a scientific calculator with a natural textbook display and as well as multi replay function similar to the Casio model we discussed earlier. It is quite useful for high school students. It supports a lot of functions including advanced statistics, LCM/GCD, Logs, and others. Most of the functions you need as a student are there in this calculator. It has 9 constant memory locations. Which is quite useful when you are solving complex problems. It also comes with the multi replay function which allows you to backtrack and see the complete step by step calculations of every problem. This also enables you to edit the expressions and recalculate the answers in real time. This calculator also comes with a natural textbook display which displays the expression exactly as it would appear in a textbook. One user called this product as “best scientific calculator for a girl” which many people think is quite an accurate description of it. I won't make any gender stereotyping here associating the color pink with girls but it is really your decision whether or not you find it appealing. If you like the design and colors, just go for it. This model also comes in blue and black colors. Now let us get into the real business. It is finally the time to jump into the subject. Even when it comes to purchasing the very Perfect calculator, one should not get biased and just ‘go’ for the product, simply because the product does not have a VERY heavy priced tagged and is less expensive than the other gadgets. Remember, money these days are hard earned and hence every investment counts and hence should be worthy of it whatsoever. Hence, one has to be very careful before purchasing any electronic product and things are no different when it comes to purchasing a calculator. Firstly, you can check for any special Christmas discounts if you have decided to purchase the best desktop calculator around the time of Christmas. This will help you earn some substantial savings. Compare if it is more beneficial purchasing the product online on the internet than getting one from a brick and mortar store. Avail the discounts if they are available for online purchase, by going online. Look for the guarantee period and post-sales compensatory offers that are available, should you need it within the guarantee period. Consider the price-quality ratio and then consider it is feasible to purchase the great calculator for mechanical engineering that you are looking to purchase. Go through the calculator reviews left behind by the previous customers, as that will give you a fair bit of knowledge regarding the qualitative aspect of the product and the way it will come in handy during the hour of your need. Q: Which is the Finest Calculator? The ten products mentioned above are the Perfect calculators you can find. Each of these is great in its own way.Therefore, it is difficult to give you a single one that could be considered ‘best’. Part of the reason for this is that there are lots of different types of calculators and lots of choices. Q: Which brand should I choose? There are a lot of good calculators out there. If you want to the safety of a reputable brand, I would recommend Casio or Texas brand. These are the Top calculator brands. Let me make it simple for you. These are the three main types of calculators you will find. Regular calculators - These are calculators which you can use for basic arithmetic (add, subtract, multiply and divide). It does not come with a lot of features. Scientific Calculator - A scientific calculator, on the other hand, can help you process advanced operations like exponents, trigonometry, logarithms, factorials and much more. Graphing calculator - A graphing calculator is a scientific calculator with an additional feature. It allows you to put any function and plot a graph on its screen. These are quite useful for some students and professions. Q: Which calculator do I need as a student? If you are a student of early calculus or before, you will probably need a scientific calculator. Precalculus and above that, you will require a graphing calculator. If you are unsure, you can consult your teachers for advice on the excellent calculator for your college or school. Q: How much does a calculator cost? Depends on what you want in a calculator. Price varies across brands and it is hard to give you a clear estimate. I can say that most of them are not pricey and there are a lot of good and highly affordable calculators out there. As you can see, these are the top calculators and their reviews. I have included everything that you need to know for buying the best calculator for your work or studies. You won’t go wrong if you choose any one of them. Make sure you pick the product that fits your needs and your budget. These calculators will surely help you perform at your best in whatever you are doing. If there is anything I missed, then let me know. I am open to feedback. If you found this article useful, then share it with your audience.